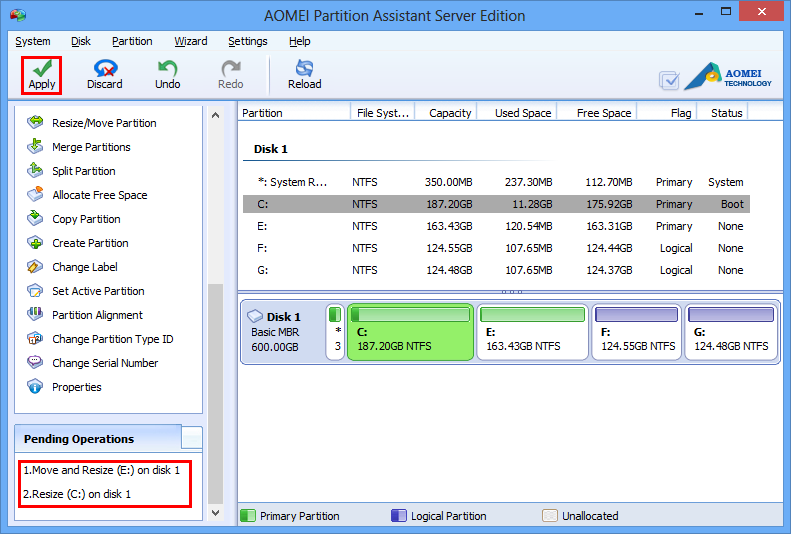 How to Resize Windows Server 2012 Partition with AOMEI Partition Assistant? Resizing Windows Server 2012 partition is a necessary operation with the using of computer. This tutorial is about how to resize Windows Server 2012 partition with AOMEI Partition Assistant Server Edition fastly and safely. Why need to resize Windows 2012 Server partition? Many computer users upgrade to Windows Server 2012 after its released. They want to enjoy the new functions of Windows Server 2012 early. Such as: updated version of Hyper-V, IP address management role, new version of Windows Task Manager and ReFS, etc. However, most of them will encountered the problem that server partition is running out of space, no free space in C drive after installing Windows updates and applications, Windows pops up “Low Disk Space” warning constantly and ask you to free up space. Facing the problems, change a bigger hard disk is one solution, but it is too expensive and will spend lots of time. So resizing Windows 2012 Server partition is the most often choice. Although Windows Server built-in disk management tool has resizing partition function, it can not help users resize Windows Server 2012 partition most of the time. For example, system partition is the most likely to be full of space, if you try Windows disk manager, there must be an unallocated space behind system partition, that means you must delete partition behind system partition. This will cause data lose. And when you want to resize system partition with Windows built-in tool, rebooting is unavoidable, thus will break your work at the same time. Thanks to the development of software industry, there are many third-party partition software to help you resize Windows Server 2012 partition. How to choose a appropriate one? Search from famous software website or forum, notice the software’s rate and assessment. You can also download the demo edition to try and test. 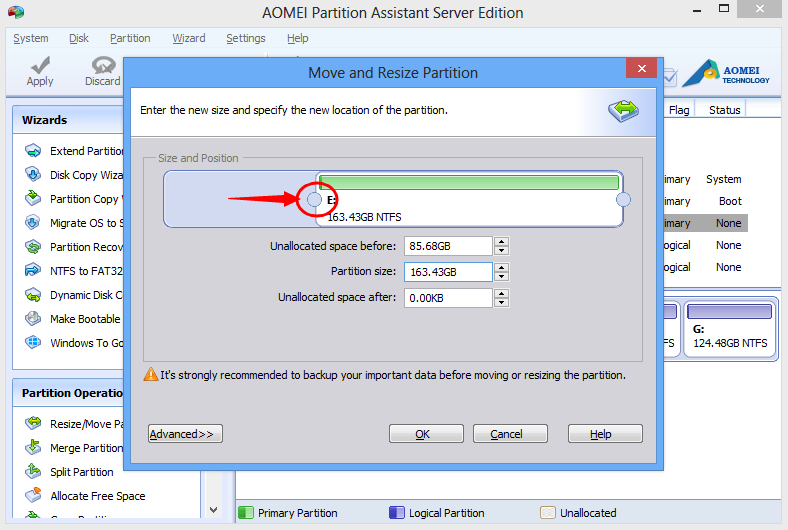 Here, I recommend you try AOMEI Partition Assistant Server Edition to resize Windows Server 2012 partition. C drive plays an important role on Windows Server 2012 because it is the system partition and can influence the speed of computer. Next, I will show you how to resize C partition on Windows Server 2012. Don’t forget to do a backup with server backup software before resizing partition. Now start to resize Windows Server 2012 Partition. If there is no unallocated space behind partition C, please read the following steps carefully. If there is an unallocated space behind the system partition, please directly go to step 2. 1. Move the cursor on partition E, right click it, select “Resize partition”. In the pop- up windows, drag the partition handle rightwards to resize E: partition and click “OK”. Then there will be unallocated space in the front of drive E(behind drive C). 2. When back to the main screen, right click partition C and select “Resize partition”. In the pop-up window, drag the partition handle rightwards to extend it. Click “OK”. 3. On the main interface, you can see there are two pending operations. Click “Apply” to commit the change. To extend system partition of Windows Server 2012, besides the above resizing partition method, you can also try “Extend Partition Wizard” from the left panel or “Allocate Free Space” option on E: partition to expand system partition directly. In a word, with the he help of AOMEI Partition Assistant Server Edition, resizing Windows Server 2012 Partition is quickly(won’t reinstall and rebooting) and safely(won’t cause data lose). Windows Server 2012 R2 was released after Windows Server 2012. It has all features of Windows Server 2012 and provides a more efficient way to manage and control the access of local and remote resource, so enterprise can benefit from a lower cost and better efficiency. After all, Windows Server 2012 R2 offers a safer and more reliable Web platform. AOMEI Partition Assistant Server Edition also supports Windows Server 2012 R2 very well. In conclusion, once you have AOMEI Partition Assistant, optimizing partition on Windows OS won’t be a headache. You can safely shrink, extend, copy and move partitions without data loss even on the boot volume.